What is and isn’t an Arctic tern? Grouped in the gulls and terns bird family (Laridae), Arctic terns are one of several species of tern that visit the UK in summer to breed. 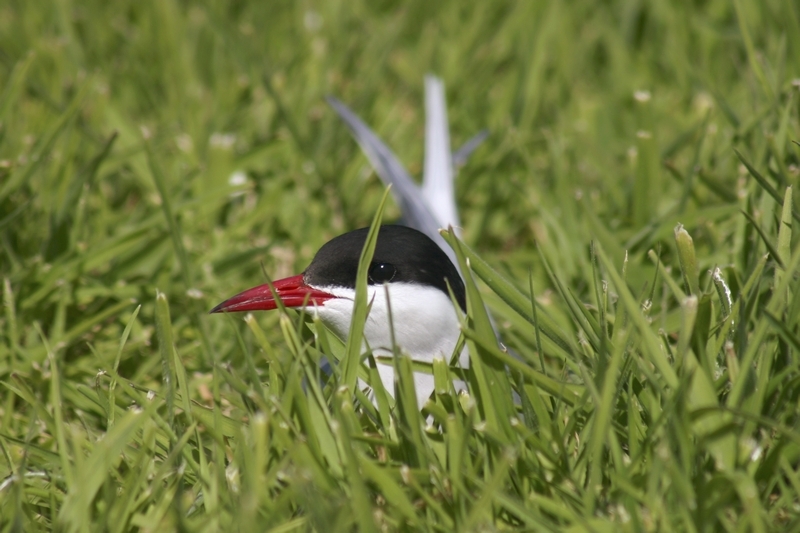 Though largely seen on the coast, occasionally you might see an Arctic tern inland migrating in spring or autumn. 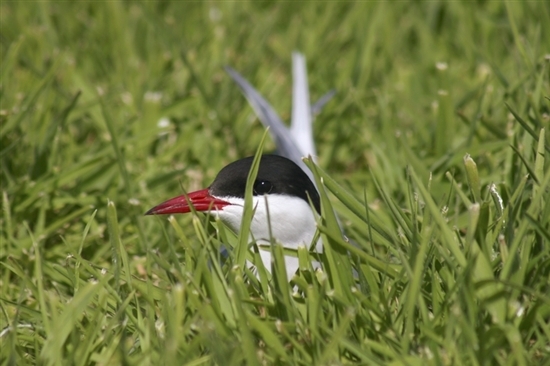 Common terns are, as the name suggests, more readily seen in summer across the UK. I still struggle to quickly tell apart many species of gull and tern, but here’s a few tips for telling if the tern you’ve just seen is Arctic or common. An Arctic tern will typically have a dark red bill, whereas a common tern’s bill will be an orangey-red and often have a black tip. A common tern’s bill is also slightly longer and pointier. This might be really hard to pick out at a distance though. Arctic terns are slightly stockier and shorter through the neck and head, made more obvious by their shorter bill. They also have a particularly shiny white cheek, which might pick them out on a sunny day, and their overall plumage is slightly duskier than a common. 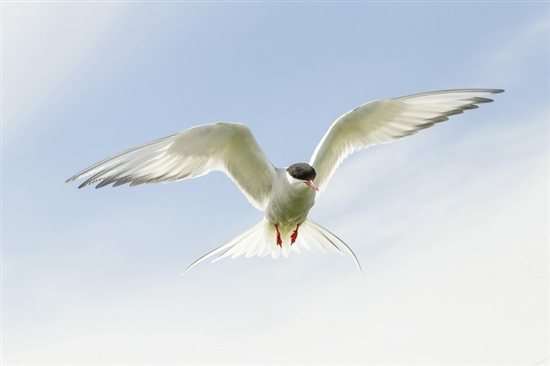 In flight, the Arctic tern, aptly named the “sea swallow” in the past, will have a more buoyant flight pattern. Listen to an Arctic tern. How do Arctic terns fly so well and so far? Nothing comes as easily to an Arctic tern as flight. Playing in air currents, pitching and awing against the wind in whimsical fashion, sudden dives to pluck fish from the surface - an Arctic tern is magical to watch. To top it off, these fragile looking birds annually undertake the longest migration in the animal kingdom. Depending on the route, an Arctic tern can migrate between 44,000 and 54,000 miles in a single return journey. Clearly this is a staggering distance, but how do they do it? Being just the right size helps. Not too big, and not too small, the Arctic tern is just right to carry enough fuel for a long journey without being too big and expending much in the rare occasion it actually needs to flap its wings. Another important adaptation for long journeys, especially over water, is having long, thin wings relative to its body size. This is known as having high aspect-ratio wings, the exact same term used in aviation. Looking at a glider aircraft, for example, you can see how this shape of wing - long and thin - allows for an Arctic tern to travel a long distance forward relative to the distance it falls in that glide. This allows an Arctic tern to drift between currents of air, only adjusting when it turns to catch the next. Efficiency epitomised. How many are there and what’s their conservation classification? The global population of Arctic terns is estimated to be around 2,000,000 individuals. The European population equates to about 1,130,000 – 1,810,000 mature individuals. With an extremely large, circumpolar range, a slowly declining speculated population trend, and a high overall population, the Arctic tern is classified as “Least Concern” (LC) on the IUCN Red List. However, their UK classification is “Amber”. Find out more about the Red, Amber and Green UK classification, or the IUCN Red List. Where do they breed and what do they do when they’re not breeding? Arctic terns can be best seen breeding on the Farne Islands of Northumberland, or several of the Northern Isles of Scotland, such as Orkney. There are about 53,000 breeding pairs in the UK, leaving much of the breeding population spread across Arctic regions of Europe from Iceland to Kamchatka, across the Bering Strait to Alaska, and right across Arctic North America to Greenland. 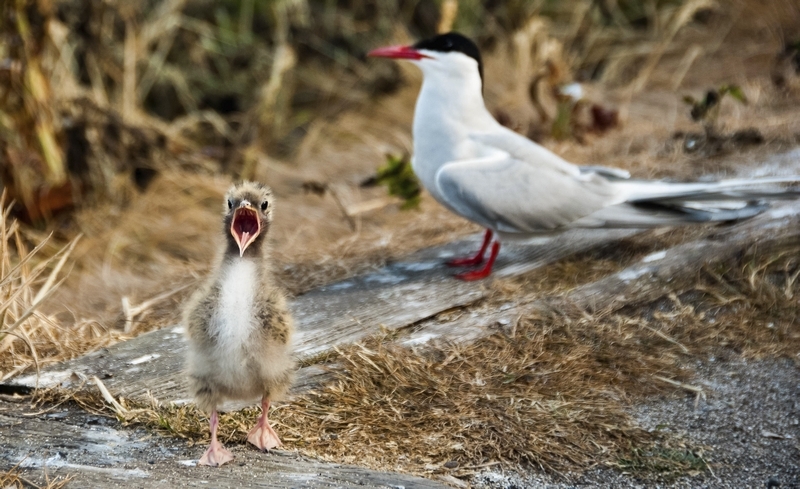 Arctic terns nest on the ground every 1-3 years, reaching breeding maturity at about 3 or 4 years of age. They’ll have one brood of 1-3 eggs, incubating for about 21-27 days. The chicks are downy (and particularly lovely looking), and although able to walk won’t leave the nest much at all until fledging around 21-24 days after hatching. Both parents care for hatchlings. Arctic terns then undertake an epic migration that sees them travel further than any other creature on Earth, and they’ll spend more time in daylight hours than perhaps anything else that lives. They’ll spend the UK winter (the Antarctic summer) off the coast of Antarctica, and moult while perched on sea ice. They like eating fish mostly, but will try the odd crustacean and insect. Arctic terns will loft and buoy above open water, waiting for the perfect moment to dive and take fish from the surface or just below the waves. They are masters of effortless flight, and I’m lucky to have – even though arguably slightly less adept – a common tern floating up and down the cool air above the river close to my home. It visits every summer, and provides endless entertainment for picnics. With huge declines in fish stocks and the general health of our oceans threatened, many of the risks to all seabirds could be applied to Arctic terns and their future survival. Where can I find out more and what can I do to help? What are some amazing facts about Arctic terns? The oldest recorded arctic tern was at least 34. Assuming it migrated along the European routes to the Netherlands, it will have travelled 54,000 x 34 miles. That’s 1,836,000 miles, which is almost 4 times to the Moon and back. Arctic terns spend longer than any other creature in daylight, as they experience summer in both hemispheres. Using the Netherlands as the example again, an Arctic tern will experience an average 14 hours of daylight a day between May and September when breeding in the Netherlands, and 17.9 daylight hours a day hovering around the 70th parallel south between October and April. The total average (median) time an Arctic tern would therefore spend in daylight could be as much as 16 hours a day. Discounting leap years, a 34-year-old Arctic tern will have lived for 12,410 days, experiencing 198,560 hours of daylight. An average human living in the Netherlands, will experience roughly 12 hours of daylight a day on average each year, or 148,620 hours in the same lifespan. Of course this isn’t very accurate at all, as like most people I slept for most of my teenage years. An Arctic tern’s average wingspan is 70 cm, meaning you’d need 62,790,698 arctic terns to hold hands to reach across the distance they migrate one-way to their breeding grounds. Arctic terns can reach speeds of 22 mph in flight. This means it would take an Arctic tern 452 days to get to the Moon from the Netherlands. For my crude calculations I used timeanddate.com graphs for Groningen in the Netherlands, Davis (69 degrees south) in the Antarctic, the average distance the Moon is away from Earth, the oldest recorded Arctic tern (a North American bird), and the distance measured for Arctic terns breeding in the Netherlands. Clearly I've fudged it a bit. If you think I’ve made a mistake, or you have some more fascinating or creative statistics, leave them in the comments below! I hope you’re amazed by Arctic terns, and now know a little more about them. The next time you see one, have a think about where it’s come from, how far away that is, and how much of the world it’s seen.